Though enigmatic, the iconography of this wallpaper—with its flowers blooming in full, Chinese phoenixes, and scenes of men from the East—expresses the Rococo and chinoiserie styles of the late Georgian and early Victorian periods in England. These styles actually have their origin in the seventeenth and eighteenth centuries, but throughout the 1800s, revival styles proliferated throughout Europe and the United States. In almost every aspect of interior design during the nineteenth century, Rococo inspiration could be found. With its undulating curves, lightness, and the inclusion of flowers, this wallpaper would have fit perfectly into one of these interiors. The botanically incorrect amalgamation of flowers represents both the femininity and delicacy of the Rococo as well as an emphasis on the exotic—one of the hallmarks of chinoiserie, a style that often went hand-in-hand with the Rococo. Chinoiserie is a style in which Western designers translate eastern-inspired motifs. During the Regency Era in England (1795-1820), “oriental” styles were in favor. There was no consistency to what this constituted; “oriental” decorations and motifs could range from Chinese to Indian, Egyptian, Turkish, or Saracenic. Though aspects of the depictions on the wallpaper may be realistic, this is not the point; with its attention to fantasy over reality, the foreign nature of the scenes would have appealed to Western audiences. 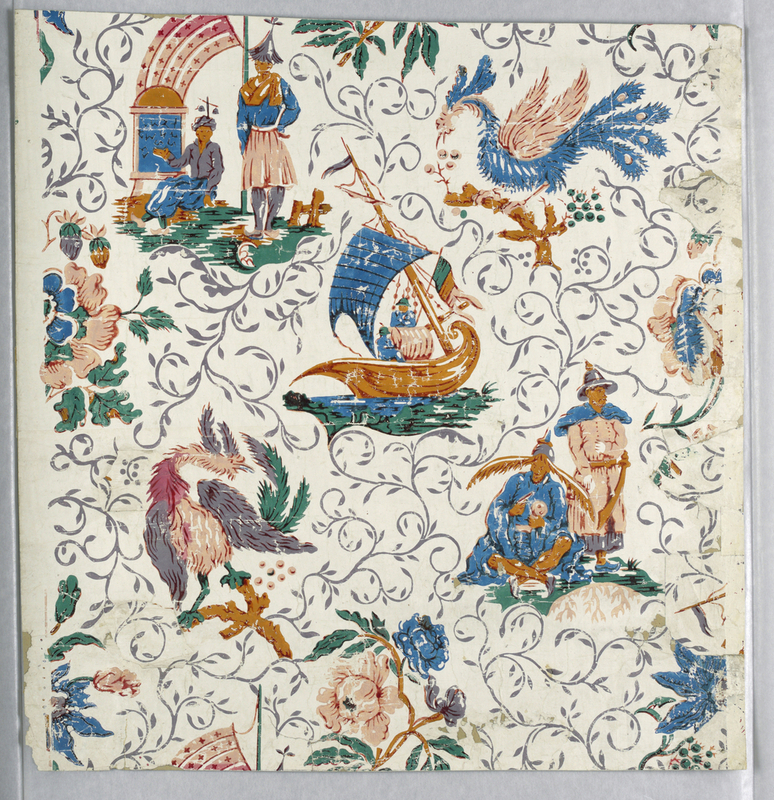 The images on this wallpaper can be described as à la Pillement, after the original chinoiserie designs by French painter and engraver Jean Pillement. These motifs were so ubiquitous that we often see reconfigurations of the same designs. In fact, because of industrial innovations in the early 1800s, similar wallpapers were made for middle class consumers, allowing them to emulate the vogue styles of the nineteenth century.